During the week, the salaryman sits at a desk in a company in Tokyo. On weekends, he wrestles. 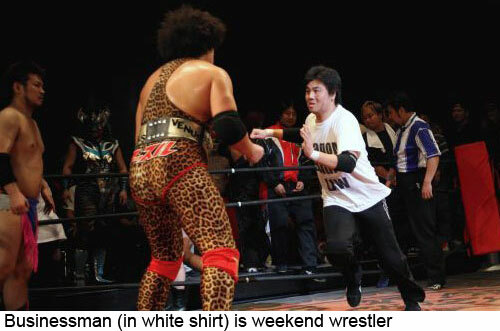 But he is not a-pro wrestler. Not a semi-pro wrestler. No, there is a new category – according to this man – that is a league below semi-pro. The man appears at events that draw only a handful of spectators. He gets injured. And he has lost a match to a woman. Get clicky to read more about this new entertainment field just across the intarwebs a bit.